Bonhoeffer studies of the past sixty-five years have traveled along two streams, sometimes in parallel, sometimes merged. Call them thinking about Bonhoeffer and thinking with him. Thinking about Bonhoeffer has necessarily been dominant, not least because it is the prerequisite for thinking with him. The culmination of the first stream is the now completed Dietrich Bonhoeffer Werke/Works, seventeen volumes of gratifying detail surrounding Bonhoeffer's life, writings, and context. Several biographies, including Bethge's definitive Dietrich Bonhoeffer, round out the corpus. While a discovery here or there may yet surface, safe to say it will not alter the nuanced portrait of Bonhoeffer already in hand. Thinking with Bonhoeffer is another matter. That began quite early--recall John Robinson's Honest to God (1963) ­ and it continues unabated in the present, with an eye to the future. Witness the theme of the 2016 International Bonhoeffer Congress in Basel, Switzerland: "Engaging Bonhoeffer in a Global Context: Christian Belief, Witness, Service." Sub-themes include: "Christian Faith and Inculturation in a Secular Culture," "Being a Christian in a Pluralistic Context," "Learning from the Global Church," "Christian Ethics ­ Common Ethics, " "Reconciliation." And these don't tally the long list of papers yet to be submitted and selected, all "Engaging Bonhoeffer in a Global Context." There is no signal that thinking with Bonhoeffer has reached some culminating point or end stage, akin to the Werke/Works. Books continue to appear, conferences routinely take place, and classes about Bonhoeffer, his life and significance, dot college and church offerings. All this said, there remains the occasional instance when both thinking about Bonhoeffer and thinking with him come together in a new publication that pushes past borders into new territory, for Bonhoeffer studies and for us. 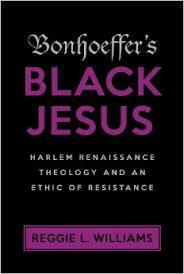 Reggie Williams Bonhoeffer's Black Jesus: Harlem Renaissance Theology and An Ethic of Resistance is one of them. Every portion of that title and sub-title carries weight for thinking about Bonhoeffer from this point forward. Although the clues were there in his own time in Harlem and his coursework and conversations at Union Seminary in 1930-31, including his essay on the literature of African Americans, the picture of Bonhoeffer's "Black Jesus" was never fully drawn until now. Nor did we have "Harlem Renaissance Theology " exegeted, and the ties to Bonhoeffer made. Not least did we fully appreciate the subtle and substantive ways in which these contributed to the "Ethic of Resistance" for which he is famously remembered. We had Eberhard Bethge's testimony that Bonhoeffer spent about as much time in Harlem as on campus, thanks in large part to his friendship with Franklin Fisher, one of the few African Americans at Union at the time. But we did not have such a careful and convincing tracing of this experience and its impact on Bonhoeffer. And not at the edges of his life and thought but at the center; namely, Christology and ethics as these faced virulent racism (white racism in the U. S., Aryan racism back home). This is my second reading of the Williams text. The first was at the request of his doctoral advisor, Glen Stassen, when it was in dissertation form. My conclusion then was that, if published, it could transform Bonhoeffer studies for any work focusing on the early 1930s and their impact on Bonhoeffer's course. While that conclusion holds, the reading this time underscores something else. Williams is wholly at home with Bonhoeffer's life and thought as a whole. While the theology of the Harlem Renaissance and the Black Jesus of African American church life is Williams' distinctive contribution, no guarantee follows that the subtleties uncovered there, and their influence, would be detected in the drama of Bonhoeffer's engagement back in Germany. That requires a substantial command of his biography and his thought, especially his Christology. Despite the compact text (only 140 pages), such close familiarity is apparent and used to full advantage. That Williams' writing is also highly accessible renders this relatively short book ideal for most any audience that wants to know Bonhoeffer as well as think with him about the incarnation of prophetic justice in our own lives. The book's dedication is for his wife and children, for his mother, and "For Glen, my fiercest advocate." Glen Stassen, a mainstay of the International Bonhoeffer Society, died of cancer last year. But he was able to see the dissertation become the book and to see Williams take his own place in the Society. We have both Glen and Reggie to thank for this good work. Larry Rasmussen Reinhold Niebuhr Professor Emeritus of Social Ethics Union Theological Seminary.